Cheap scrapbook stickers do not have to make the entire layout look cheap. Scrapbooking is a wonderful way to document the important events in your life. Whether it is your baby's first smiles or photos of that dream vacation, by employing a few simple techniques you can complete layouts without breaking your budget. Discount embellishments can also look as good as the expensive varieties and create a "wow" factor by following these suggestions. 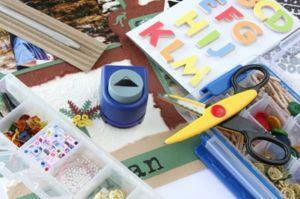 The most common place to find cheap scrapbook stickers is discount stores with craft sections like Wal-Mart. Arts and crafts stores such as Michael's or Hobby Lobby sell a wide variety of themes and manufacturers. Both stores typically have multi-packs available for discounted rates and will allow you to use coupons from their weekly fliers to get even further reductions. Most scrapbook specialty stores often have "bargain bins" where out of season themes are marked down as much as 50 percent. In addition to discount or arts and crafts stores, online retailers are a good place to find cheap scrapbook stickers. The the most popular scrapbook retailers online is Scrapbooking Warehouse which offers over 2900 different choices overall with several hundred options under $3. Stickers Galore is an online shop that specializes in stickers and even has an entire section devoted to cheap scrapbook stickers. Filter by theme, price or manufacturer to find the right stickers for your project. Since many of the cheap scrapbook stickers are either outdated colors or trends, it is a good idea to modify them in some way so your layouts do not also look dated. Use some of the painting or distressing techniques below to keep your layouts fresh. Another consideration is size. Smaller stickers are typically less expensive but you want to employ design techniques such as layering to prevent them from being lost on your page. One of the biggest complaints most scrapbookers have when using letter stickers is that there is not enough of the common letters and vowels. Often when you purchase an alphabet pack there will be an extra one or two vowels and letters such as "S" or "T." If the title requires multiple letters like Merry Christmas that needs 3 "R"s, you often have to resort to purchasing more than one alphabet pack to complete the title. Discount stores such as Dollar Tree typically stock stickers for use in scrapbooking in the event you definitely need more than one pack and do not want to spend a fortune. A suggestion for whimsical or party pages is to use the ransom technique. Similar to a ransom note where letters are cut randomly from magazines and do not match, the ransom technique utilizes letters from multiple size or style alphabet packs to create the title. This allows you to use the remnants of many packs and not have to buy additional packs of the same stickers to complete the layout. If you like the shape of the letter sticker but not the color or pattern, consider using the paint overlay technique. Place the stickers onto a piece of cardstock and lightly press. Do not press firmly because you may tear the paper when you remove the stickers later. Choose a paint color that coordinates with the paper you plan to use and with the colors in the photos on your layout. Using a flat bristled brush, stipple the paint around the stickers with a pouncing motion. This is similar to wall stenciling but with the paint on the outside versus the inside of the template. Do not to put too much paint on the paper because it may bleed under the sticker and ruin the effect. Once the paint is dry, carefully lift the stickers. The result will be a title with an airbrushed shadow outline. Shape stickers are available in a myriad of themes ranging from flowers to zoo animals. Utilizing techniques from other areas such as interior design, painting or furniture refinishing on your scrapbook layouts create distinctive designs regardless of the money you spend. Small stickers have a tendency to get lost on a layout if used randomly. Designers often quote the "Rules of Three" when staging a room and you can apply this design rule to scrapbook layouts. Grouping three cheap scrapbook stickers together packs a much bigger design punch than a single small sticker. This is especially helpful if you only have a limited number of stickers and want to convey a clear theme. Once you have matted and adhered your photos to the cardstock, apply your stickers. Start with the largest sticker and place it in the center of the design area. Often this may be on either side of the title or along one corner of a photo mat. After the main sticker is applied, simply layer the remaining stickers on either side making sure they overlap slightly. If you plan to use more than three stickers, it is best to layer in odd numbers such as five or seven to create visual interest. Most stickers are bright colors that may not be appropriate for heritage or black and white photos. To make the stickers more relevant to your chosen theme, opt to take lessons from furniture refinishers. Refinishing a piece of furniture first requires you to sand the surface in order for the new paint or stain to adhere. The same is true for stickers. Using fine grain sandpaper or sanding block, lightly sand the surface of the sticker. You can either sand just the edges for a slightly worn look or sand more heavily across the entire surface to leave a fully distressed look. For a vintage look, use a bit of walnut ink on the surface to create a sepia tone color. Add the stickers to your layouts as desired. The most important aspect of using stickers is allow for them to embellish the photos and not take away from the message you are trying to convey. Regardless of the theme, use cheap scrapbook stickers to create timeless layouts. Whether for your own enjoyment or in order to document your life for future generations, make sure you have fun with it and the process will never be time wasted.